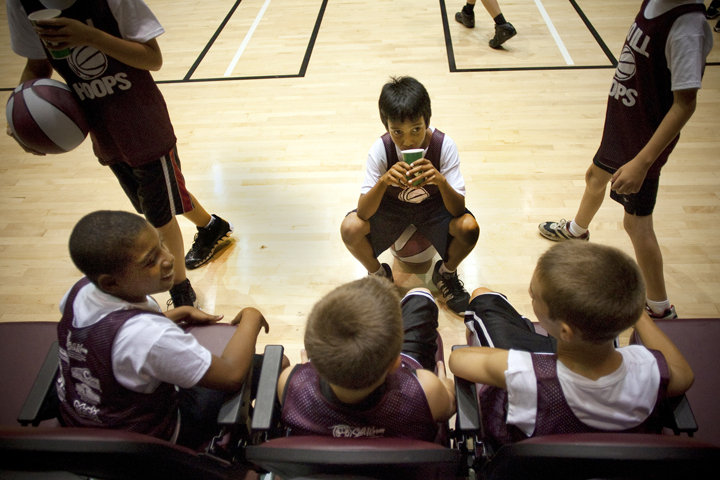 Zachary Pereira, middle, 11, of Carbondale, Ill., and James Allison, left, 11, of Jeffersonville, Ind., talk with friends during a break Tuesday at Saluki Basketball Camp at SIU Arena. The camp hosts 65 students ranging from third to eighth grade and operates Monday through Thursday. Many students return to the camp every year. “I keep coming back. I have so much fun here, and I love the sport,” Pereira said. This entry was posted on November 4, 2011 by Brooke Stevens. It was filed under Kids, Sports .